Price skimming can be considered as a form of price discrimination. On the release of a new product, a very high price is set at first in order to maximize profit by selling the good to “early adopters”. The price slowly decreases with time in order to maximize profit by selling the product to other types of customers. Apple is well-known for its skimming pricing. Whereas a new iPhone is very expensive, its price decreases gradually over time. And while consumers with very high purchasing power will be prepared to buy the new iPhone at its initial price, most potential consumers would not be able to afford it at the early stages of the product release. One year after the release however, the price of the iPhone will be decreased and more consumers will therefore be in a position to afford it. The price will be further decreased with every year that passes, signifying that more and more consumers will opt for the iPhone. Every consumer has a “reservation price” for every product. The reservation price is the maximum amount they are willing to pay for the good. If a consumer is not interested in buying a certain product, his reservation price tends to be zero. With price skimming, all consumers will be charged at their reservation price, thereby maximizing the profit of the company selling the good. Let’s assume that Apple has three types of customers: “early adopters” (category 1), “mid adopters” (category 2) and “late adopters” (remaining category of customers who tend to wait for the price to go down before purchasing). The reservation price of the three types of customers is respectively p1, p2 and pc, with p1 > p2 >pc (see graph below). Now let’s assume that Apple sets a unique and invariable price that does not change over time, or in other words, it does not use price skimming. If Apple sets their price at p1 level, only the early adopters (category 1) will buy the product. If they decide to set the price at p2, both category 1 and category 2 will purchase the good, but category 1 will buy at p2. And finally, if they set the price at pc, every type of customer will buy the phone at this price, including categories 1 and 2. Below, the graph on the left illustrates the producer surplus and the consumer surplus in a situation where price skimming is not applied and where Apple opts for setting the pc price from the very beginning. In this case, Apple does not maximize its producer surplus. With price skimming, Apple will, at first, sell its iPhone at p1, thereby maximizing its surplus on category 1. Following this, Apple will sell its product at p2; category 1 has already bought it at p1 and since category 2 will now buy the good at p2 Apple maximizes its profit on category 2 in this case. Lastly, Apple will sell its iPhone at pc which will make category 3 buy the phone. With price skimming, Apple will maximize its producer surplus by taking some of the consumer surplus. This is illustrated by the graph on the right. Price skimming and penetration pricing are two opposing long-term strategies. 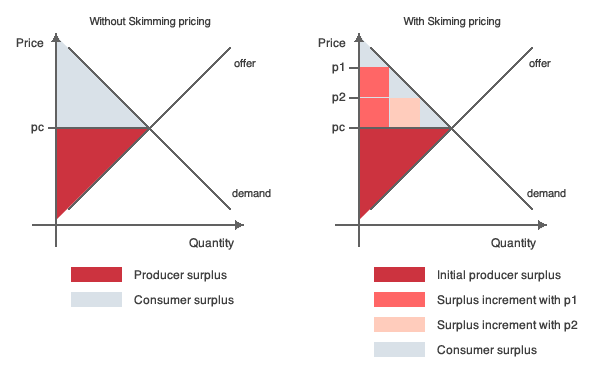 Price skimming consists of setting high prices and reducing them over time in order to maximize profit in the long term, while penetration pricing consists of setting low prices and increasing them over time. According to a study by Spann et al relating to the pricing methods used in the German camera market, price skimming is used more frequently by established manufacturer brands, in markets with low competitive intensity and in medium-priced or high-priced industry segments. In order to use price skimming, it is necessary to have an established well-known brand so that early adopters can quickly become aware of the new product. If the early adopters are unaware of the existence of the product upon its release, they will not purchase it at the initial high price. Low competitive market intensity is also a determinant factor for price skimming because in a highly competitive market where many different product options are available, the early adopter will buy a cheaper (but equivalent) product from a competitor, rendering the demand for the new “skim-priced” product practically non-existent. Finally, it is important to take into account that price skimming works best in high-priced industry segments. This is due to the fact that with lower-priced products the difference between the initial high price and the consecutive lower price will be too low for reaping any significant profit benefits. As illustrated by the example of Apple above, the high tech sector is a good example of an industry where all the conditions necessary for price skimming tend to be fulfilled. In this market, we can find many established manufacturer brands (Apple, Samsung, Sony, etc. ), low competition (today, there are only about 10 smartphone brands on the market in total) and this industry segment is indeed known for its high prices (most recent iPhone is priced at approximately $1000). At institutional level: price skimming is a complex form of price discrimination. In most countries, price discrimination is illegal and price skimming could therefore be a risky strategy for companies to adopt. At market level: Skimming often results in high margins. Since high margins are obviously very appealing, competitors will want to enter the market with the same or a highly similar product, making the skimming effect slowly disappear. Skimming is a temporary strategy. At brand level: If it becomes too obvious for consumers that a firm is employing a skimming pricing strategy for any given product, they will either wait for the price to go down before purchasing or be disappointed if they have already bought this product at a very high price. In both cases, this results in negative publicity for the brand. Another issue that may arise from using skimming pricing tactics relates to generating very high margins. This may indeed be problematic as with high margins there is less incentive to keep costs under control for example. At retailer level: Skimming implies selling a product at a price that is lowered on several occasions, starting at a very high price and gradually reducing it further and further. The inventory turn rate could suffer from this since only a small proportion of the overall customer base is targeted at a time (each time the price goes down for example). For instance, a very low product volume may potentially be sold during a product’s launch phase as the product price is too high for the vast majority of consumers at the product release stage. At customer level: Skimming is associated with price discrimination over time, and therefore implies that a product will be distributed more slowly.